With this approx. 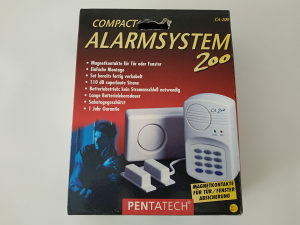 200 Compact Alarm System you specially smaller items. For example can be so very well sheds, garage, caravan or boat. The system consists of a control unit with siren and code keyboard, an indoor or outdoor siren and a pair of magnetic contacts. The external siren is very loud (110 dB) and deters any thief. The system is with the control unit it is activated by CODE user codes and can also be disabled. The alarm is triggered the fact that the magnetic contacts each other Be Removed If Preferred. This can be done for example by opening a door or a window. What is more, the system against Sabotage. It is a tamper alarm by the removal of control unit or by the jamming the power supply from the phone holder The control unit. Due to the complete wiring system is very easy to install. The complete system requires no external power supply, as it's powered with 4 x 1.5 V AA Batteries (not included).